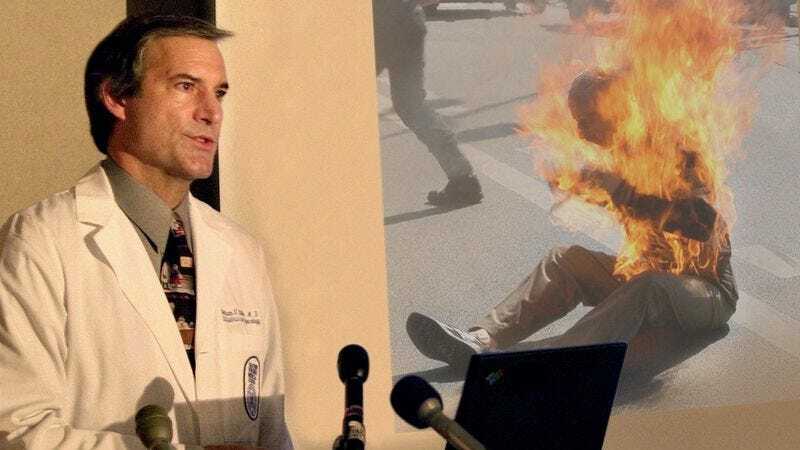 NEW YORK—In a stunning announcement that has sent shockwaves throughout the field of public health, the American Medical Association officially changed its long-held stance on self-immolation Friday, reversing decades of support for the ritualistic practice of lighting oneself on fire. “After careful reevaluation and extensive discussion within the medical community, we have found it necessary to cease advocating for individuals to douse themselves in kerosene or other flammable chemicals, go out into the middle of a public square, and set their bodies aflame,” said AMA spokesperson Arnold Krbecek, who confirmed that an official bulletin had been sent to all 220,000 AMA-member physicians alerting them that the practice of self-immolation had been associated with adverse health outcomes and could prove lethal in extreme cases. “Immolating oneself remains a patient’s choice, but it is only one in an array of options that we encourage them to discuss with their doctor. The AMA will simply no longer be requiring that physicians prescribe it to their patients.” Krbecek also confirmed the organization’s view on hepatitis was still under review.